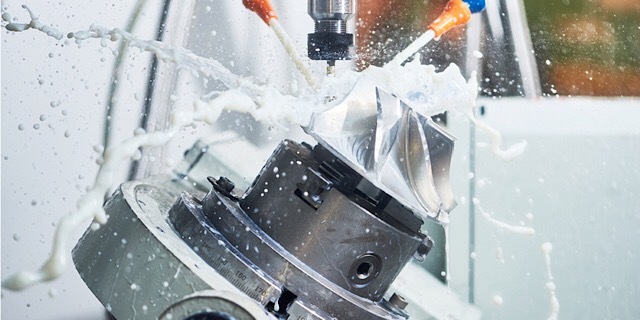 CNC machining is one of the most developed material processing techniques in the world. Manual machining that has existed for a long time, but only recently have we reached the level when the hardware electronics could be employed to make CNC metal machining techniques the leading method of manufacturing metal parts. Experienced machinists and versatile machines can be great helpful for even the most complex precision machined metal components. 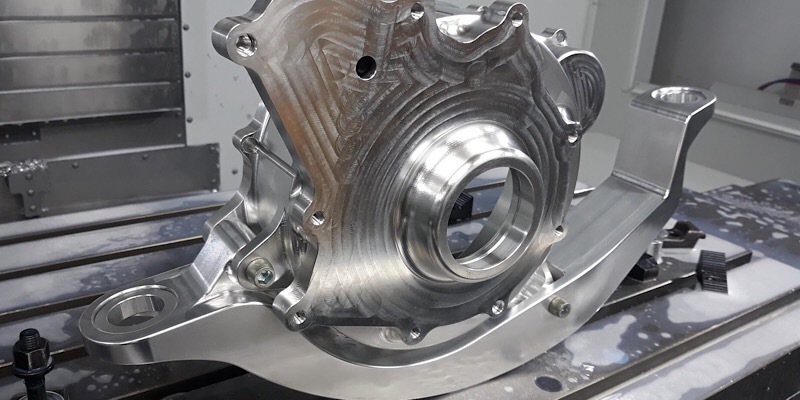 With the advanced multi-axis machines, along with the capabilities of high precision in-house deburring and mechanical polishing , machine turned parts with difficult metals are not become hard. When it comes to the precision machining services, we cannot deny that multi-axis like 5-axis EDM equipment adds the ability of machining capability wire-cut electrical discharge. Metal processing has always been dependent on the metal machinist's skill. The capabilities of the process were determined by what kind of surfaces he could make on his equipment. In order to make some complex or high-precision element, specialized tooling had to be made specifically for the surface to be manufactured. This made manufacturing complex customized parts with machining very expensive and unprofitable. However, with the development of CNC metal machining, the capabilities of the process have spiked. The NC program can obtain practically any kind of surface. With the rise of CNC control systems, manufacturing custom machined parts has become a viable possibility. Versatility and the positioning precision of CNC machine tools enables a drastic simplification of setup operations. There is no need to make specialized fixtures or setup tooling for complex parts. Everything can be set up using standard adjustable fixtures and the machine tool positioning system will compensate for the inconsistencies. The methods that are most widely used with CNC for custom machined parts are turning milling and EDM wire cutting. One of the advantages of using CNC is high precision. The machine tool is equipped with step motors that have positioning precision of only a few micrometers. Automatic tool change and consequent calibration using a touch probe ensures that the cutting edge is exactly where it is supposed to be. Some machine tools even take cutting tool life and wear into account and adjust it while operating. Modern tool bearings ensure the optimal spindle rigidity for minimum vibration and the fact that the metal machinist doesn't need to look at the part closely all the time makes it possible to close off the working zone and employ high-pressure coolant bringing temperature distortion to a minimum. High power capacity and the rigidity of modern machine tools ensure that almost any kind of metal can be machined. Starting from common construction steel and up to different grades of stainless steel, including heat-resistant steel-nickel superalloys, all of those materials can be processed. Even titanium alloys with the worst machinability parameters can be cut. After all those hard-to-process alloys, I shouldn't even mention that CNC centers can process lighter softer alloys such as aluminum, brass, copper, gold, and silver with ease. The main difference is the tool life and viable cutting parameters. 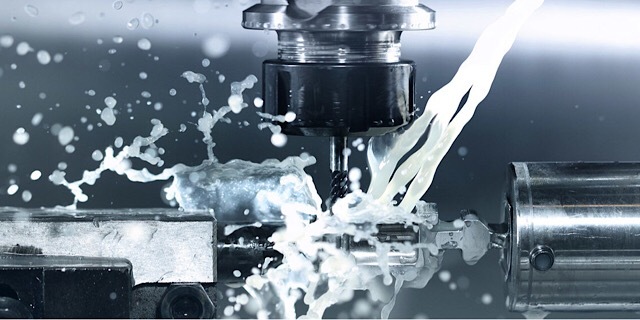 5 axis milling centers are the pinnacle of CNC metal machining systems. The cutting tool can be moved along all the coordinate axes and can be tilted at an angle to any of the three axes. In 3+2 machining methods the tool is usually tilted at a constant angle and in 5-axis machining the movements are all simultaneous. 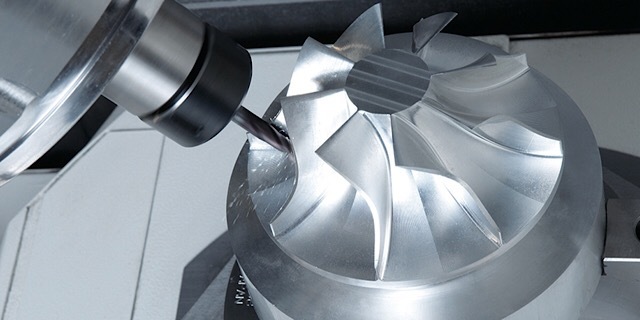 5-Axis machining techniques are ideal to manufacture custom metal parts with freeform surfaces. The capabilities of 5-axis CNC centers are very wide. It's versatile multi-axis machining capabilities allow it to perform turning, boring, drilling, hexing, milling, threading and tapping at almost any angle. A whole multitude of methods can be united into one processing operation with the use of CNC programming and automatic tool change systems. TheNC program ensures absolute repeatability of the conducted operation so an optimal quantity of parts can be obtained. Lathe turning equipment is perfect for axially symmetric bodies. 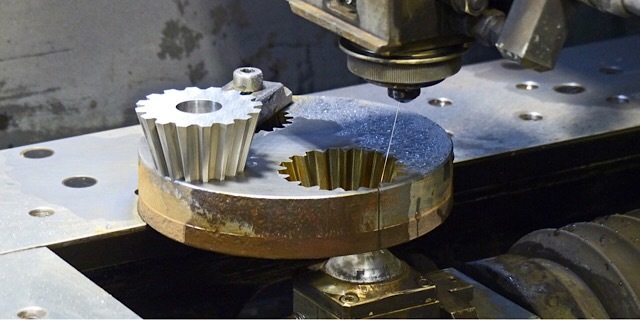 Previous versions could only manufacture cylindrical, conical and axially symmetric profiles but modern CNC lathes have tool turrets, which can be mounted with small milling spindles to make grooves, flats, and other asymmetric elements. Drilling boring threading and tapering of non-axial holes has also become a possibility with CNC equipment. CNC lathe machining offers some advantages compared to other types of turning. Tailstock use. You can process very long parts by fixing the end of the part in the tailstock center. Wire-EDM machining is a considerably new process that involves high-precision cutting of conductive parts by using high voltage current passing through a very thin wire and the material separated by a non-conductive liquid. CNC systems have made this process capable of producing precise small parts in a completely automatic operation mode. Effective for hard-to-process materials. The wire doesn't actually touch the material. It is evaporated because of the discharges between the tool and the part. There is no physical contact so the hardness of the material doesn’t matter. Only its conductivity. Cut accuracy. The overall accuracy of the cut is ±0.0001” (0.00254 mm). It depends only on the quality of the wire, which has become increasingly great. Burr-free. Since there is no physical contact between the wire and the part, no plastic deformation takes place so there is no burr at the entrance and the exit of the tool. No regard to the size of the cut. Drilling deep holes becomes very hard because drilling is a physical process that requires system rigidity. Tapered and complex shapes. The CNC controlled wire can move in any direction and create complex freeform cuts. Apart from that, some systems allow the tilting of the wire, which means you can use it to create tapered surfaces. Why metal cutting For wire EDM machining services? High precision. A freeform hole or an edge with 2.5-micron precision makes it a very lucrative option for high-precision processing of hard materials. Highly repeatable lengths. The wire moves according to a CNC program, which is constant and has an absolute precision independent form the metal machinist operating the equipment. No deformation distortion or delamination. The temperature and the cutting force of the part are minimal unlike milling or turning where considerable heating and forces are applied. So, there is virtually no thermal or plastic deformation after the processing. No heat treatment is needed as well. Internal corner radius as small as .0025″ (.064 mm). Milling and turning inevitably leave a radius at the corners of the part because of tool geometry. Wire EDM doesn't have this disadvantage and leaves virtually no radius at the corners. Small cut diameter. If the material is expensive and you are working in close quarters, it is good to employ EDM cutting since the wire is only 0.1-0.5 mm in diameter. In addition to aluminum parts, we offer innovative CNC metal machining services, especially on aluminum prototyping, custom aluminum machining, CNC aluminum, aluminum milling, including other CNC soft metal such as Magnesium, Zinc, Titanium and CNC hard metal such as Steel, Stainless Steel etc.